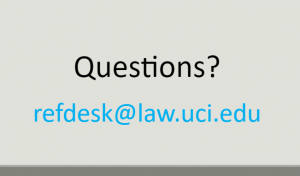 Here are the slides from the recent Law Library presentation to new editorial staff of the UCI journals. UCI Law Library Source Collection Guide. This is the online guide I talked about at the start, with tips for all types of sources and guidance for journal-related ILL. Slides – Collecting Sources 2017 LawNet ID required. Congratulations to the new editors! We look forward to working with you this year.